Gosh, 6 months ago, I did a project sneak peek on a Serene Master Suite makeover that was in the works. You can see all the reasoning behind the madness and many of the product picks and whys in the link. And if you follow my Instagram account, you may have seen some updates from my #HDGbowbeautiful project (this suite, a son’s room, and the beginnings of the kids’ shared bath). What that original post didn’t show you are the “before” pictures, which demonstrate how truly dramatic this transformation has been. But First — Home Glow’s Exciting News!!!! I’ll make it super quick. 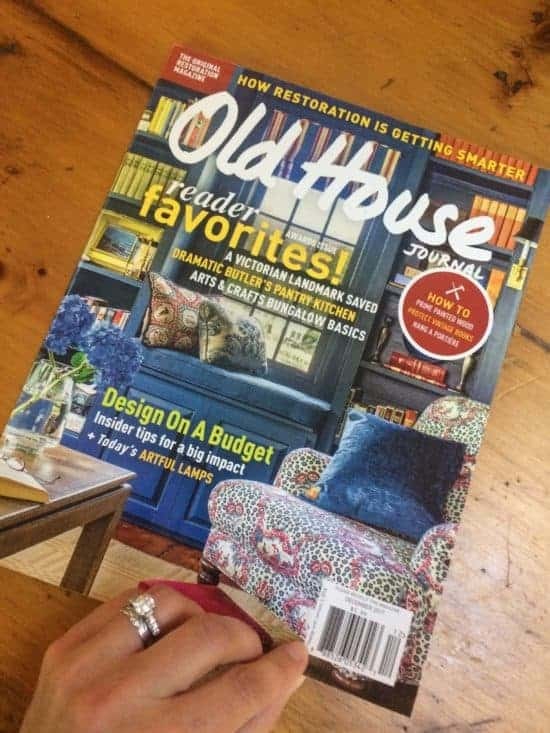 Home Glow Design is the the COVER STORY of Old House Journal’s double issue on editor and reader favorite projects for 2017! Did I freak out? Yes. Editor Patricia Poore wrote a chock-full story, with 7 pages of before-and-after pictures of our 1790 Federal farmhouse and many of my tips for where to splurge and where to decorate your “forever home” within your budget. On stands now, or you can view online. Ok, first happy dance over. The second will now begin. Briefly — through the years, my client’s house had become cluttered with hand-me-downs and cast offs. She finally wanted to create an environment that actually represented her and her family with high quality, good value furnishings. She loves “brown” furniture. She also prefers soft curves to hard angles, both in furniture and in fabric patterns. The house is a late 1970s colonial in a cul-de-sac neighborhood full of similar houses, along with some Cape Cods and ranches. As always, I decorate keeping in mind the style and value of the house and the neighborhood around, if applicable. The bath was not going to be a part of the project originally, but then my client decided, “Why stop when you’re on a roll?” And it definitely needed to be done. All photos are by the lovely Sabrina Baloun of Sabrina Cole Quinn Photography. Overall, we balanced high quality American made furnishings in things that would get a lot of wear and tear — case goods, upholstery — with other to-the-trade items and a few retail finds. There are items in here that are to-the-trade but that you can also find through some online retailers. If so, I’ve provided links. Just know that when clients work with me, they get significant discounts. The inspiration for the room was this stunning custom wool rug from Julie Dasher, whose artistry and fair-labor practices I profiled here. It’s also the reason why this room took so long to complete! A custom, hand-knotted rug takes about 5 months. We asked for all the floral highlights to be in silk-like nylon. Unlike viscose, which many rug companies use to create a silk-like sheen, nylon doesn’t show water stains. So if you spill your morning tea, no biggie. The lovely chair is from Charles Stewart Company, a beautiful, trade-only line of upholstery from North Carolina (you name it — kiln dried hardwood construction, 8 way hand tied springs, spring down seats, super comfy and heavy) that is also very well priced. We covered it in a discontinued Beacon Hill chenille, found at one of my favorite online sources for discount designer fabric. The dresser and bed are by Harden. The table is a Wisteria’s wonderful ghost table. I have access to a number of acrylic side tables, but I love this one’s classic tripod shape. And, if you can get it on sale, it is extremely well priced. Also shown is Wisteria’s very skinny floor lamp. When I proposed it to my client she said, “That is just so funny, I have to have it!” It does a great job lighting up a dark corner. We were lucky to find that huge sweater-weave basket, which brought in some natural texture (and keeps things from becoming too shiny), to hold extra comfy throw blankets. My client has a penchant for all things Asian. She loved this choice of Bungalow 5’s Ming White Grasscloth bedside table, which also brought in some more natural texture. The Raffine Table Lamp by Currey & Co. (along with the purple table lamp, featured further down) is 2o% off at The Mine through Nov. 5. Again, we were going for serenity, and nothing says serenity like matching your drapes and walls. This Robert Allen Nova in Nickel for the drapes was a great match for Benjamin Moore’s Penthouse on the walls. My client wanted total blackout, so in addition to having the drapes lined with blackout lining, we also did a Roman shade in a gorgeous Stark cotton fabric that has a subtle sheen and wave-like embroidery. The pattern doesn’t read well in the pictures — just too far away. Trade only. We found the bone inlay tray at Home Goods, but here is a similar one on Etsy or here from Ebay. 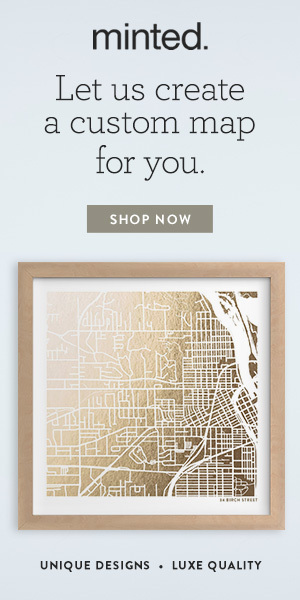 The art was framed by my local framers, Rowland Studio, which I profiled in my post about the myth of the mega framing sales by some Big Box crafts stores we all know. I love the way the light shining through the windows makes the lamps look like sea glass! The ceilings are low and the headboard is a stunning burl wood. We decided to leave the space above the bed empty to show off its curves. The super soft, cashmere-like throw is available in 15 colors. The washable, crushed velvet quilt is by Pine Cone Hill. The deep purple Aubergene Table Lamp is from Currey & Co. The bathroom is about as tiny as a master bath can be and still allow for 2 sinks — 42 square feet with a shower. We wanted the marble to really be the star and everything else to be as seamless as possible to create a sense of space. Therefore, we kept the wall tile/counter surface consistent looking, used the same hex floor tile on the main floor as well as in the shower and the same color on the vanity and walls, installed a fully glass shower, and a single mirror. All fixtures are in polished nickel, my client’s favorite finish. We had 84″ inches of space for the vanity, but only 13.5″ of depth right by the door. We didn’t want to have a 72″ vanity randomly stuck in the corner, so we custom designed this one with Crown Point Cabinetry to have the inset, flat-front stack of drawers on the right almost to look like a different furniture piece. They are shallow and perfect to organize my client’s makeup and beauty essentials. The tile is a 6″ x 12″ Asian statuary marble up the shower and around the walls for a wainscot with a pencil liner on top. I considered a more formal chair rail silhouette, but this bathroom is so small, I thought simple was best here. The floor is a 2″ hex mosaic in Asian statuary marble. All tile is from Artistic Tile in Nashua, NH. The Aerin Rosehill sconces were the first thing chosen for this bathroom. My client wanted one large mirror for over both sinks, and the Anthropologie Aperture Mirror fit the bill perfectly. The Kassatex Baratta Turkish Cotton Bath towels (in taupe, which reads as a warm gray, but there are 3 other embroidery colors) are from Bed Bath & Beyond. We wanted to bring in some color and reference the palette of the adjoining master bedroom. A Roman shade in Robert Allen’s Mamma Mia in Wisteria was an economical and understated choice. We had an anti-microbial finish applied to deter mold. Benson pulls in rose quartz and nickel from Addison Weeks were a splurge but worth it! I’m afraid they are no longer in stock, but AW has many other stunning options. The vanity top is LG Viatera’s Minuet, a marble-like quartz and one of the company’s more popular patterns. Because of that, we were lucky enough to find a remnant through Rumford Stone that was long enough. Buying an entire slab would have been cost prohibitive for a bath vanity. There is nothing more spa-like than marble, IMO. 🙂 As I said in this post about common tile mistakes in the bathroom, I prefer quiet shower niches that don’t stand out by having contrasting tile treatments. The husband asked for his own little niche to the left of the shower fixtures. You can see how there isn’t a spare inch in this bathroom! The toilet (not shown, to the left of the shower, shown in the mirror) and glass shower are directly opposite the 84″ vanity! We went as airy as possible and did a fully glass shower with nickel hardware. Beckett Glass did a fabulous job. I highly recommend them if you’re local. As I said earlier, we have done the oldest son’s room. I’ll do that reveal in a few weeks. Hope you enjoyed! Would love to hear your thoughts. ‘Til next Saturday. Lovely rooms. I’m disappointed that I can’t see the floral highlights in the inspiration rug in the after pictures. Thanks, Becky! 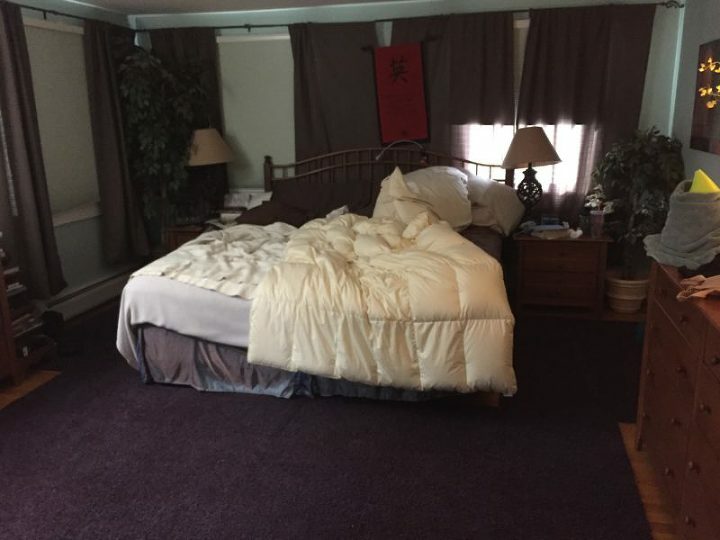 I know how you feel about the rug pattern not being shown in the pics. The bedroom is a nice size, but not huge, and the biggest floral pattern is in the corner just as you walk in the door. It’s subtle and beautiful. We didn’t want an all-over pattern. The reason that it isn’t shown in photos at that angle partially has to do with lens width. (I’ve taken just enough photography classes to be dangerous in my explanation!) The lens can’t take in all the unaided eye sees. So, in order to get that corner of the rug to show along with more of the room, the camera angle would have had to have been so wide as to slightly bend the room — like in some of those unnatural real estate photos you see. Or a pic would have had to be taken almost straight down, with just a whole lot of the foot of the bed showing. Or taken from outside the doorway of the room, which we couldn’t do because the hallway hadn’t been redecorated.